Welcome to the 25th Anniversary Edition of RGC! 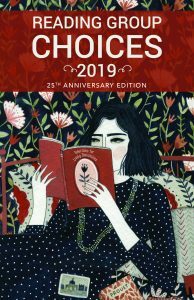 Welcome to Reading Group Choices 2019, our 25th anniversary edition! The 2019 edition is now available for purchase (eBook and paperback) on our website. We hope you enjoy the variety of fiction, nonfiction, and young adult titles we have recommended this year. Thank you, readers, for your continued support, interest, and passion for books as we celebrate our 25th year! Have fun choosing your books for the year. We wish you happy reading and discussing!